Beginning in 2011 a four-koma manga series called Is the Order a Rabbit? began running in Japan and despite only gathering enough content for a few volumes by 2014, an anime series was created. When it comes to series like this, they live and die depending on how well fans take to the characters in a slice of life series. 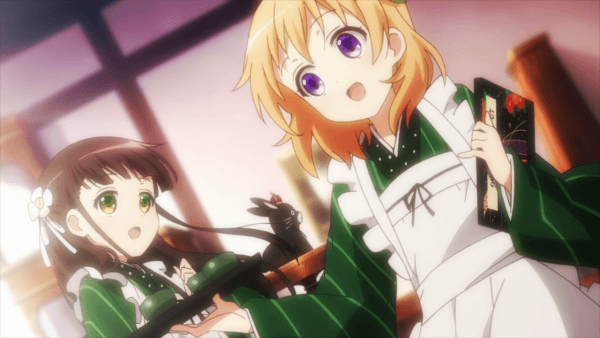 With a second season currently airing in Japan, the first season of Is the Order a Rabbit? has been released in the West, is this series one worth picking up? A young high school girl named Cocoa Hoto has just arrived in a new European-themed town where she will be attending high school for the next few years. While searching she comes across the Rabbit House café and, thinking that it will be filled with rabbits, enters the place only to find a young girl named Chino working alone with a large white fluffball on top of her head. It just so happens that the ball of fluff is actually a rabbit named Tippy and that the Rabbit House café also serves as the residence of Chino and her family, exactly where Cocoa is supposed to be staying. After stumbling upon her new place of residence Cocoa quickly makes herself at home and learns that the Rabbit House was founded by Chino’s grandfather and that during the day Chino runs the coffee shop while at night her father takes his place behind the desk and serves alcohol alongside the aforementioned rabbit who just so happens to be able to speak in an old man voice through mysterious circumstances revolving around Chino’s grandfather and possibly Cocoa at a younger age. Cocoa is more than happy to be staying with Chino as she has a self-admitted sister complex and eagerly works alongside Chino in the café, even going so far as to bake special bread from time to time since it is her specialty. Chino is a bit cold to Cocoa but never more than necessary and even though she doesn’t like how clingy Cocoa can be at times she accepts her as a new friend easily enough. Joining the pair is another girl named Rize who spends her time working at the café when she isn’t training. 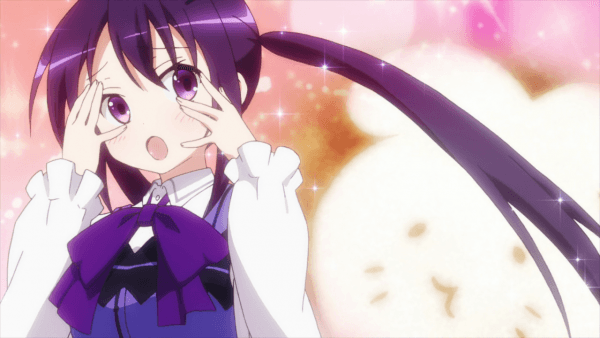 You see, Rize comes from a well-off family where her father is a soldier and has drilled her into being an excellent athlete with a habit of carrying around a gun or a knife. Despite her serious and straightforward nature, she enjoys feminine things even more than any of the other girls as she often swoons whenever something cute happens or is shown to her. Alongside Rize we have Sharo, another girl who attends the same school as Rize who looks up to Rize due to her saving her from a feral rabbit at a young age. Despite not enjoying coffee thanks to the way caffeine makes her act hyper, she is more than willing to spend time with the three although she is trying to put on the show of also being from a rich family despite living as a scholarship student next to the final main girl in the series, Chiya. Attending the same school as Cocoa, Chiya works for a rival coffee shop but that rivalry has long since faded, allowing Chiya to become quick friends with Cocoa since they both share a fondness for rabbits and have similar personalities while also easily getting along with the rest of the group. Is the Order a Rabbit? is the type of slice of life series that rarely goes deep in any way. There are a few elements that are tapped upon such as hinting at the mystery of why Tippy appears to contain Chino’s grandfather but the series never brings drama more than one of the girls catching a fever and the rest caring for her in a heartwarming manner. Instead this is the slice of life series that is all about setting an enjoyable and comfortable mood where the viewers are able to unwind and enjoy a series that follows the four girls as they take part in various activities such as making latte art, picking out new mugs, telling fortunes from coffee stains, and only occasionally actually focusing on how the girls are actually in school still and simply playing around. This of course means that Is the Order a Rabbit? isn’t the most engaging series in the world but it does provide its fair share of laughs, cute scenes, and heartwarming moments that fans of this type of series will be looking for. Something that helps set Is the Order a Rabbit? apart a bit from your standard slice of life series is how the story spends most of its time centered around the girls actually spending time or working around their respective cafés. The quaint European theme to the town presents a calming and unique atmosphere to surround the cast and although the series is very colorful they are toned down a bit to not appear garish against the backdrop. 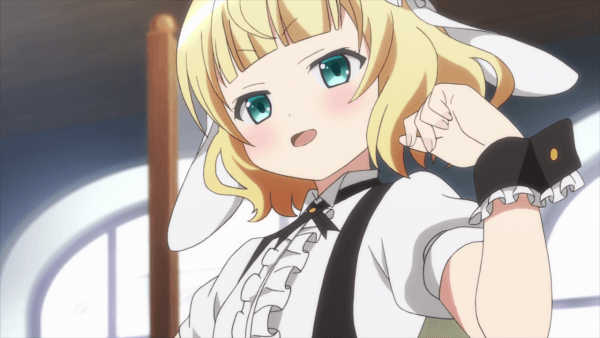 The character designs are as cute as they come with the “moe” nature being pushed to the extreme very often, usually for comedic purposes due to Cocoa’s reaction. Plus considering the rabbit themed nature for the series one can expect plenty of different rabbits to appear at random times, with even Tippy being a rabbit breed that I didn’t know of at the start. It is worth noting that there are some very minor fan service elements though this is given little focus since most of it comes from the girls playing around during the summer than anything else. Considering Is the Order a Rabbit? 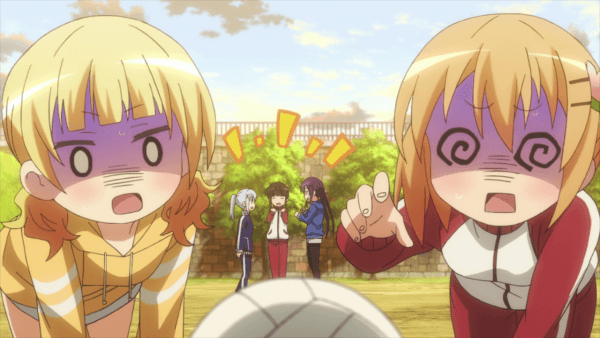 is a slice of life anime series it shouldn’t come as much of a surprise to hear that Sentai Filmworks has chosen to release the series with only the original Japanese voice track accompanied by English subtitles. This is a smart choice given the nature of the series and the possibility of certain jokes being lost in translation as the original voice actresses perform their roles perfectly here. The soundtrack features a nice mix of calming background music and comedic tunes depending on the situation while the opening theme “Daydream Café” is sung by the voice actresses for the main girls and is very enjoyable and the calming ending theme “Poppin’ Jump” is sung by the voice actresses of Chino and her two school friends. The only bonus features contained on this release are clean versions of the opening and ending animations as well as trailers for other Sentai Filmworks anime releases. 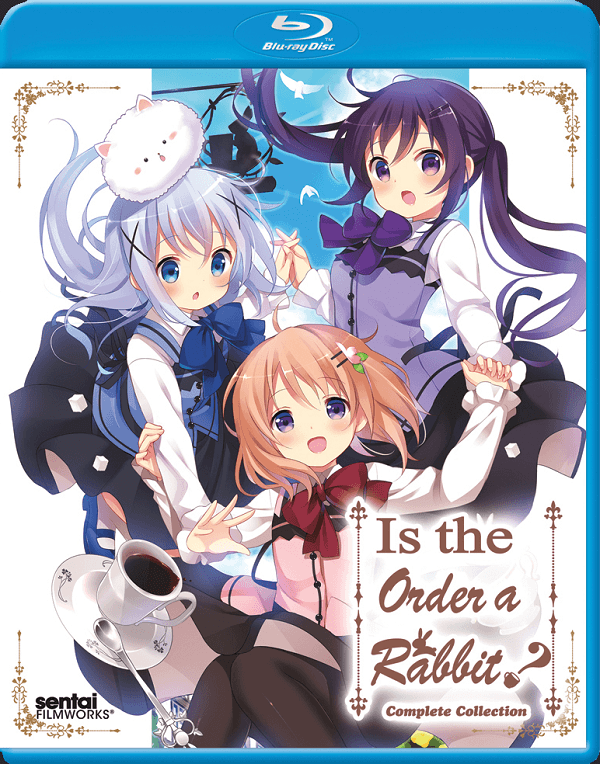 If you are looking for a slice of life series that you can sit down and relax with a few laughs then Is the Order a Rabbit? fits that category perfectly even if it does have its fair share of standard cliches. 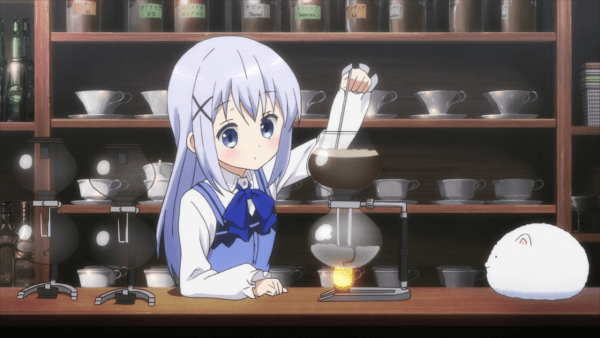 This series doesn’t attempt to explain various oddities in the world or throw any drama at the viewer to advance things and instead focuses on creating a charming atmosphere where the girls spend their days playing around in everyday and strange situations as well as partaking in various café activities ranging from making tea, baking bread, and brewing coffee. This does mean that those looking for something a bit serious or something with a twist halfway through will find the series lacking but for everyone looking for a light and enjoyable series then Is the Order a Rabbit? is right up your alley.